White House is harder to see now because of the additional vegetation. 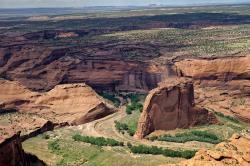 This is the only site in Canyon de Chelly that is accessible without a guide and is by far the most visited ruin in the canyon. A hiking trail leads to the site from a parking lot on the rim above. A pedestrian bridge over the wash can be seen, as can the hiking trail. Tour trucks and jeeps park at the ruin-end of the bridge, although they ford the wash rather than crossing the bridge. Even outside the wash, plant growth is lusher today, in part because the site is not being grazed as intensively as it was in 1929. Photograph by Adriel Heisey, 2008. Sunday, October 25 -- it’s the day to be on Museum Hill for the long-anticipated opening of Oblique Views: Archaeology, Photography and Time. You’ll see historic images by Charles and Anne Lindbergh side by side with those of contemporary aerial photographer Adriel Heisey -- some of the changes in the landscape (Canyon de Chelly, Chaco Canyon, Galisteo) are profound, others are more subtle. Photographer Adriel Heisey speaks at 1pm and again at 3pm. The Red Turtle Dancers of Pojoaque and Santa Clara Pueblos will display a butterfly dance, buffalo dance, and rain dance. Dance times are scheduled for 2pm and 4pm. Of course we’ll have the beautiful hardcover Oblique Views catalog available for purchase, with the contributers all present to sign. A hands-on photography activity will be offered from 1 - 4pm. Admission is free on Sundays for New Mexico residents. See the full color postcard here! 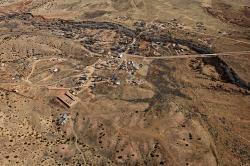 Galisteo is now considered statistically part of the Santa Fe metropolitan area, although it is still remote and has a population of less than three hundred people. It is home to a number of well-known artists and scholars, as well as families traditionally linked to the area, none of whom farm on the scale of the past. Galisteo Creek no longer washes away vegetation in the streambed, which now appears to be a lush forested strip. The church and cemeteries remain, as does the layout of the colonial village. Traces of the old narrow fields can still be seen. Photograph by Adriel Heisey, 2015.